Every group of friends includes that one person who -- no matter what part of town you end up hanging out in -- always knows exactly where to take you to get the best food for cheap. If that person is you, and you're the one friend that everyone relies on for where to find, say, the best deli BLT in NYC or the best cheap burritos in San Francisco, then there's a new job at Thrillist with your name on it. Following its spectacular first season on YouTube, Thrillist is bringing back the hit series 5 Buck Lunch for a big batch of new episodes. On top of that, the show is getting a major makeover with epsiodes in three cities -- New York, San Francisco, and Washington, DC -- this time and three new hosts, which is where you and your next-level local food secrets come in. That's right, Thrillist wants to give you the chance to star as one the new hosts for 5 Buck Lunch. Producers are accepting applications... now. To apply, all you have to do is email talent.desk@thrillist.com with a compelling case for why you should be one of the new hosts. The position is paid, but the biggest perk -- by far -- is all of the free food and internet exposure you'll get along the way. You'll also get to tell the world about some of your favorite cheap eats and all the best tips for how other people can enjoy them too. Think of it as the most delicious love letter to your city. If, for some reason, you haven't seen an episode of 5 Buck Lunch, don't worry. You can watch every single episode from Season 1 on Thrillist's YouTube page and get caught up on the hunt for cheap grub in NYC. 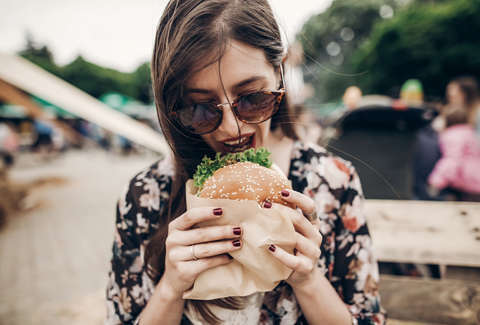 The premise of the show is simple: Thrillist's certified foodie will take you on an adventure all over town to find the absolute best lunch you can grab on a budget of just $5, with all of the leftover cash rolling over into the next episode. It's almost like a game show, and you (and your wallet) are the winner. Sound like your dream gig? Don't miss out.